Modern theories explaining the evolution of early life forms on Earth still follows the strictly Darwinian thinking modeling evolution of life forms through the survival of variations in the harsh processes of natural selection. On the one hand, there is the rather inexplicable raw material of life that just happens to exists and on the other hand the natural processes that modify its growth and development. 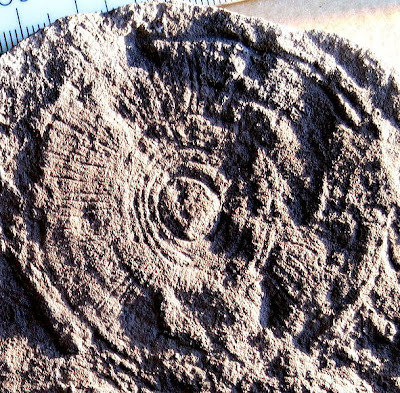 It took almost 4 billion years from the formation of the Earth for the Ediacaran fossils to first appear, 655 million years ago. Whilst putative fossils are reported from 3,460 million years ago, the first uncontroversial evidence for life is found 2,700 million years ago, and cells with nuclei certainly existed by 1,200 million years ago: Why did it take so long for forms with an Ediacaran grade of organisation to appear? It could be that no special explanation is required: the slow process of evolution simply required 4 billion years to accumulate the necessary adaptations. Indeed, there does seem to be a slow increase in the maximum level of complexity seen over this time, with more and more complex forms of life evolving as time progresses, with traces of earlier semi-complex life such as Nimbia, found in the 610 million year old Twitya formation, (and possibly older rocks dating to 770 million years ago possibly displaying the most complex morphology of the time. The fundamentally Darwinian discussion on Ediacaran environment quoted above focuses attention to possible factors that affected the evolution of life on planet Earth. The ideas can be and have been further studied and in this way natural sciences progress increasing the knowledge humanity has about the reality where it is living, past, present and future. Darwin's theory has been so fruitful in the world of science - counted among the most significant scientific theories ever - because it focuses attention to verifiable explanations, suggestions that can be studied with various means, viable theories that can be rejected or accepted in a critical process. Primary size-limiting factor is the amount of atmospheric oxygen. Without a complex circulatory system, low concentrations of oxygen cannot reach the centre of an organism quickly enough to supply its metabolic demand. On the early earth, reactive elements such as iron and uranium existed in a reduced form; these would react with any free oxygen produced by photosynthesising organisms. Oxygen would not be able to build up in the atmosphere until all the iron had rusted (producing banded iron formations), and other reactive elements had also been oxidised. Donald Canfield detected records of the first significant quantities of atmospheric oxygen just before the first Ediacaran fossils appeared — and the presence of atmospheric oxygen was soon heralded as a possible trigger for the Ediacaran radiation. Oxygen seems to have accumulated in two pulses; the rise of small, sessile (stationary) organisms seems to correlate with an early oxygenation event, with larger and mobile organisms appearing around the second pulse of oxygenation. However, the assumptions underlying the reconstruction of atmospheric composition have attracted some criticism, with widespread anoxia having little effect on life where it occurs in the Early Cambrian and the Cretaceous. Such ideas about the atmosphere and global temperatures guide field research and accumulating evidence may support the theories or suggest others more plausible. The research origins of life in the fields of Geology, Paleontology, Evolutionary Biology, and Astrobiology to mention just some leaves a great number of questions aside from discussions as not belonging to the realm of exact natural sciences. Scientific research deals with evidence and how it can be understood experimentally and theoretically and limits itself to that. Ancient Greeks were able to think. Greek natural philosophers tried to figure out how things are in the nature and were rather good at it. Democritus described just by thinking atoms and Aristotle established principles of classification that are still used in modern evolutionary biology, in fossil research and almost everything as a valuable research tool - putting things were they belong to! We also believe what the Bible reveals to us that God of Israel has created life and everything. This is not science or smart thinking but religion that deals with matters of faith and believing or not believing. Theology does not suggest alternative scientific models for explaining the origins of life. Then it would not be Theology but science, or in worst case pseudo-science like Creationism. The best natural scientists, including Charles Darwin himself, are left after all their work with deep theological and philosophical questions that their researches bring to greater focus. As human beings, they also seek answers to them - from materialistic atheism were evolution is given a divine character to theological models, including the Judeo-Christian faith in God the Creator.